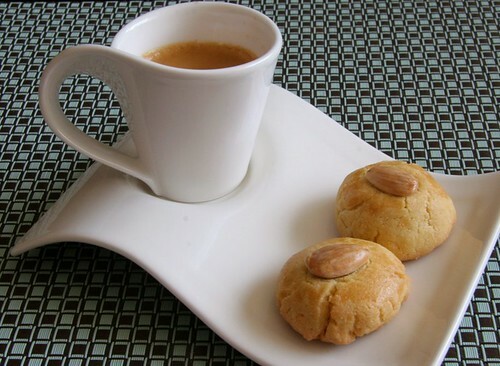 When I eat cookies, I like them semi-sweet, a bit crunchy, and served with a shot of strong espresso. That’s why I love biscotti. I can’t get enough of the double-baked crunch, the almond flavor, and the joy I get out of dipping them into coffee. Recently, I’ve been experimenting with Moroccan and Algerian cookies, which often include almonds and sesame seeds and offer subtle, almost savory flavors. 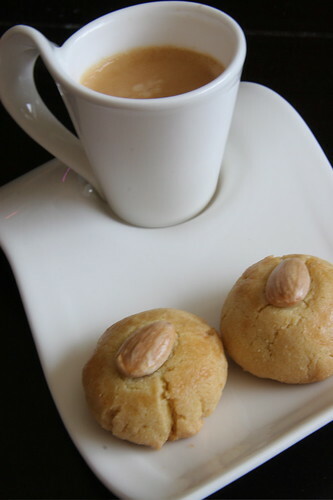 This is a blend I created from Algerian and Moroccan recipes for semolina cookies. Served with a shot of espresso, it's the perfect mid-afternoon treat. Melt the butter over low heat. Skim off the white froth and then pour into a mixing bowl. Cool. Thoroughly mix the two flours and the sugar into a bowl. When butter is cool, stir in the eggs and vanilla. Add to dry ingredients and knead well. Cover with plastic wrap and allow to sit for 1 hour. Preheat oven to 350F. Knead the dough again until smooth. Shape the dough into balls (about 1 tablespoon each). Place on a cookie sheet an inch apart. Press an almond on top of each cookie. Brush the tops with egg whites. Bake for 25 minutes or until lightly golden. About once a month, a group of our friends gather for what’s become known as ‘stinky cheese night.’ We pick a house and a weeknight slot, and then everyone brings cheese, wine, and whatever else we feel like sharing that's simple and low-key. The ritual is great for a couple of reasons: We get to see our friends without having the stress of cooking, hosting, or even cleaning for that matter (my husband and I just shove the mail off our dining room table to make room for plates). And it fits nicely with one of my favorite pastimes – fondling, sniffing, and lingering over the three large cheese counters at our grocery store. I love all kinds of cheeses, but my cheese shopping has formed a bit of a pattern – I stroll slowly by the American and European firm cheeses filling the first counter, sniff and paw at a few of the Italian cheeses at the second counter, and then arrive in my Shangri-La: the French counter where an array of natural-rind cheeses awaits my eager nose. Recently, while lingering over an orchestra of fleshy little rinds of all shapes and sizes with my husband, I spotted a wedge that I hadn’t seen before. I picked it up and inhaled deeply through the plastic wrap like a hound meeting a new dog. “What’s your name?” I wondered. It was small and soft with a pungent smell and a beautiful grey-white natural rind. A food writer with his own cheese? In a flash, the tender morsel was in my basket. When we got home, I placed the wedge on a small plate and within minutes, this triple cream, 75 percent fat cheese turned to ooze. I ditched the crackers I was going to eat it with and, like a child with a melting ice cream cone, started scooping and scraping it with my fingers to keep it from dripping over the plate. The taste and texture was unlike any other natural-rind soft cheese I had ever tasted: unbelievably creamy with an earthy but clean flavor up front; a metallic high note in the middle; and jolt of pepper going down. 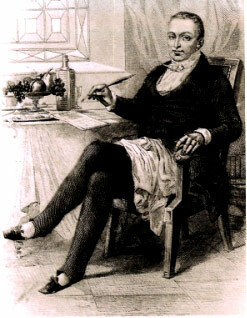 I searched the Internet and found out that Jean Anthelme Brillat-Savarin was the author of “The Physiology of Taste,” which was translated by one of my favorite food writers, M.F.K. Fisher and is the source of many well-known quotes including “tell me what you eat, and I will tell you what you are.” The cheese, which is neither pressed nor cooked, was created in honor of him sometime around 1930 by Henri Androuët, the father of the famous cheese maker Pierre Androuët in the Normandy region. When I offered it up at our recent stinky cheese night, the little lump of ooze seemed to pale in comparison to the dizzying array of cheese wedges brought by our friends, but when I told the story of Brillat Savarin – the lawyer turned food writer, everyone was intrigued and quickly snatched a piece. The idea of a cheese named after a famous food writer prompted us to start inventing personalities for the all cheeses at the table. There was the savvy, French-speaking lady’s man; the chipper, clean-shaven American go-getter (“What’s with the attitude from the French?”), and the somewhat frumpy, sour, old maid who really burned quite hot on the inside. Hey, cheese has character. You might as well go with it. That kind of stuff? I could understand if they didn’t carry it, but the attitude I could do without, thank you very much. The fact was that I had just begun to overcome my own bias against the slippery innards, recognizing that they were respectable cousins to goose and duck livers (which, in pate form, I would happily slather on a crusty French baguette). The last thing I needed was to be snubbed by Whole Foods. But the message couldn’t have been clearer: chicken livers were considered unworthy to sell in their store. Obviously, there is a disconnect between the culinary tradition of France, where chicken livers are used in pate and added as the piece de resistance to salads, and that of the United States where they aren’t offered at all, or are dime-cheap, deep fried, and sold by the bucket. 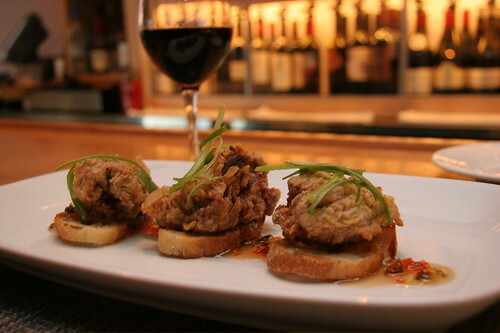 So when I saw fried chicken livers on the menu of Grapeseed, one of the finest wine restaurants in the Washington D.C. area, I was surprised and amused. What were they up to? I wondered. Apparently, I wasn’t the only one. When word got out that Grapeseed had added fried chicken livers to their first course menu, there was definitely a buzz, said Grapeseed’s Chef de Cuisine Jason Ramos. “A bunch of my chef friends called me and said, ‘how are those chicken livers?’” said Ramos, chuckling. Adding triglyceride-raising southern comfort food to a fine dining menu could be considered risky. But the Washington D.C. area is just the kind of place that such an experiment could work. It caters to beltway elite but is still south of the Mason-Dixon line where down-home cooking rules. Grapeseed, which offers 100 wines by the glass, serves their livers with poblano and bell pepper jelly and suggests pairing them with the Trentadue “Old Patch Red” from California. The recipe is similar to one served by the James Beard award-winning Cochon restaurant in New Orleans, where Grapeseed Owner and Chef Jeff Heineman drew his inspiration. Whatever doubts I had vanished. When the waiter came back by, I announced our first course: fried chicken livers. Their crispy outer edge and soft, pink middle dipped in poblano jelly (basically a fancy sweet and sour sauce) presented enough range in flavor and texture to keep me poised for more. “Becoming” is the operative word. Chicken livers still have a ways to go before everyone has gotten the good news. When my mom approached her meat counter recently in Portland, Oregon and asked for chicken livers, the butcher wanted to know if she had cats. We hopped out of our dusty car and were greeted by a young boy who led us around back to a small restaurant. I slipped off my shoes, and entered the dim, cool hut with my socks on, and sat cross-legged in a semi circle on the blue-and-white checkered blanket. Even though it was May and the markets were already full of strawberries from the warm, sunny days, the evenings were surprisingly chilly. The eating room, which was one of four set apart from the open-air kitchen, warmed quickly with the heat of six hungry travelers. Our group settled into a semi-circle facing the door so we could keep an eye out for the waiter. Minutes later, our server appeared -- the same boy who greeted us. The slim boy was about 12 years old with wide cheeks and shiny black hair wearing a red soccer T-shirt. He held a basket of unleavened bread in one hand and a pot of tea in another. He came back several times, bringing teacups and silverware, and then bowls filled with a mixture of cooked tomato and onions as our appetizer. After hours of not eating, my stomach lurched with hunger. I tore a piece of bread, spooned the sauce over it, and gulped it down. The boy returned with a steaming platter of rice pilaf and stewed beef. The moist, mildly-spiced dish of which I never learned the name, offered simple, savory flavors and was a satisfying main course. I enjoyed it with my two photographer colleagues and Kyrgyz guide, who were traveling with me to record a USAID project on land reform for my work. When we were ready to go, we learned that the dinner bill had already been paid. We looked at Almaz, our Kyrgyz guide. He smiled and shrugged. “Thank you,” I said. We met and talked to more than 20 people while traveling in Jalalabad. The next day we met up with a shy, gold-toothed widow who lived in a simple, one-room house invited us in for tea. Mansura Mamsadikova, a 49-year-old mother of two teenagers, filled our cups with the steaming liquid then surprised us with a plain but generous meal of bread, peanuts, jam, and mints. 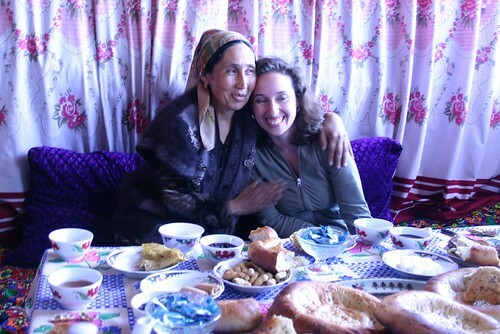 We heard Mansura’s story and so many like hers -- one generous bread loaf and cup of tea at a time. Like Mansura, everyone we met was so willing to give and to share food and drink. I later learned that generosity was the key to surviving the nomadic life that had dominated the region for centuries. The rural citizens still thrive on an informal economy of mutual favors. Kindness toward others has become a way of life. While in rural Kyrgyzstan, I ate boiled eggs and cold cuts for breakfast and slurped the national stew called “laghman” at a roadside restaurant in Tokmok, mid-size city outside of Bishkek. Laghman, an occasionally oily but rich, peppery mutton and noodle stew with onions, carrots, garlic, green radishes, and tomatoes, is the kind of food you would eat before herding cattle up a mountain slope in the biting cold. It's peppery and gamey and quite satisfying. At the end of our trip, we returned to the capital of Bishkek, a bustling city of nearly a million people. It seemed like worlds away from the small, rural communities we had visited. While citizens in the rural areas speak only Kyrgyz, Russian is the dominant language here. I cozied into a chair at the “Opera Lounge,” a candle-lit area with couches and tables at the Hyatt. A flautist playing Western classical music accompanied soft voices and clinking of silverware. 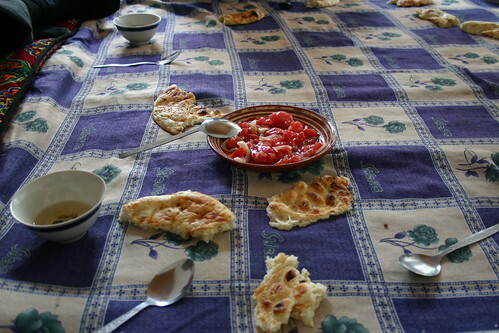 Despite my memorable experiences in the rural homes of Kyrgyz, the modern, comfortable atmosphere was a welcome. My waitress, a slim, young woman with silky blond hair and pouty red lips approached my table. She wore a crisp, white shirt and fitted black vest that gave her a down-to-business look, but her eyes sparkled mischievously. She asked me in a heavy Russian accent what I would like to drink. The menu showed three wines by the glass: a Moldovan cabernet, a Chilean Merlot, and a pricey French Bordeaux. I was amazed to see Chilean wine in Kyrgyzstan and figured it was a safe bet so picked that. “Yes, please,” she said, darting off between the tables and couches. My mind wandered to a phone call with my husband. My birthday was just a few days away. He asked what I wanted. I thought about it – shoes, a new dress? But all I wanted was to share a simple meal. Chop the meat into very small pieces and sauté with butter and the red pepper in a kazan or heavy-bottomed pot. After about 5-7 minutes add 1/3 cup of cold water. Bring it to a boil and then add the onions, carrots, garlic, green radishes, and tomatoes. Steam in low heat for 30 minutes. Turn up the heat and stir for about 5 minutes. Add cold water (depending on the number of people you are cooking for, approximately 1.5 to 2 cups per person) and bring to a boil again. Lower the heat and keep for 30 minutes more. In a separate pot prepare spaghetti or linguini noodles. Put the pasta in bowls and cover with the sauce. (Too make the dish more interesting feel free to add other vegetables such as eggplant. You can also use homemade noodles or egg noodles). In college, I embarked on an exchange program to study Spanish at a local university in the mid-sized town of Queretaro, Mexico. Living with a host family in the crisp mountain air of the Sierra Madres, I feasted on scrambled eggs with stacks of piping hot tortillas for breakfast, aquas frescas and tacos for lunch, and the sweet baked goods from the corner bakery washed down with steaming mugs of chocolate atole (Mexican corn sweet drink) for a late night snack. For Christmas dinner that year, Beatriz, my tall, voluptuous host mother made mole. She worked in her tiny, windowless kitchen all day stirring an enormous pot of silky red sauce while taking long, slow drags on her cigarette. Occasionally, ash from her cigarette would fall in the silky sauce. Even with a few flecks of cigarette ash, it turned out to be the most exotic, earthy dish I had ever tasted. For years I thought there was no way I could recreate this dish. Then I discovered Rick Bayless and other chefs offering up recipes that made it look doable. Now, broiling the tomatillos, chopping dark Mexican chocolate, and frying anchos and pasillas has become a tradition in my home. *Many combinations of mild to hot chile peppers can be used for mole. I also enjoy a mix of four anchos and six New Mexican. Guajillos are a good choice too. If you like your sauces milder, choose New Mexican instead of guajillos or pasillas, which pack double the heat on the Scoville scale. Mise en place is the French term for prepping all the ingredients in advance of cooking. With long, complex recipes like mole, advanced prep is essential to a smooth cooking process. I suggest getting organized up front: grab a big tray, then measure out all the ingredients and place them in little 'mise' bowls on the tray. Stem and seed all the dried chilies. Make sure to get ALL the seeds removed during this step so they don't get mixed in with the hot oil when you fry them. Toast the sesame seeds in a heavy-bottomed pan, stirring frequently for about five minutes. Turn the broiler to high and broil the tomatillos under the broiler flame until they start to blacken, flipping them once mid-way, about 10 minutes total. Remove from the oven and place tomatillos into a medium-sized metal bowl. Add the toasted sesame seeds to the tomatillos, reserving two tablespoons of the sesame seeds for garnish. Heat the oil in Dutch oven and fry the dried chili peppers, in batches, about 30 seconds each batch, until they puff up slightly. Do not let the oil get so hot that it smokes. When finished, place the peppers in a bowl of piping hot filtered tap water, cover with a plate so all the peppers are completely submerged, and soak for 20 minutes. Using the same oil from frying the peppers in the Dutch oven, saute the almonds and garlic until the garlic is golden brown, about five minutes. Remove with a slotted spoon and add to the tomatillo bowl. Now add the raisins to the Dutch oven oil and fry them until they are puffed and browned slightly, about 30 seconds. Remove with a slotted spoon and add to the tomatillo bowl. Season the turkey breast with salt and pepper on all sides. Heat the Dutch oven over a medium flame and, when hot but not smoking, brown it five minutes on each side. Remove the breast to a clean plate. Using tongs, transfer hydrated chilies to a blender. Taste the soaking water; if it’s not bitter, measure out 2 1/2 cups and add to the blender. If it is bitter, toss it and use 2 1/2 cups fresh filtered water instead. Blend until the mixture is a smooth puree. Using a medium-mesh strainer, strain puree into a large bowl. This removes any bits of chili skin, leaving a silky puree. Use the same blender (no need to wash it) and add the tomatillo mixture along with 1 cup water, cinnamon, pepper, anise, cloves, toasted bread, and chocolate. Blend to a smooth puree. Pour any excess oil out of the Dutch oven, leaving a thin film. Heat the Dutch oven over a medium flame. When it’s hot, add the chili puree. Stir frequently for 6 - 8 minutes. Then add the tomatillo puree and cook for another 10 minutes, stirring occasionally. Add 5 1/2 cups of water to the Dutch oven and simmer on low for 45 minutes, stirring occasionally. Season with salt (about 1 3/4 teaspoons) and sugar. Add the turkey breast to the Dutch oven. Insert an instant read thermometer into the largest portion of the turkey breast and cook until it reaches 165. Remove and place on a cutting board. Slice into 1/2 inch thick pieces and serve. Pour the mole around the meat and garnish with fresh cilantro and sesame seeds. This blog is dedicated to stories about food, cooking, and travel.